Converting A Masters Workout | Mediterra - Swim & Run Better Than Ever! The short answer is this: to keep it simple, keep the repeat distances and intensities, but identify the specific skills you will work on and the focal points and metrics you are going to use on each set to ensure that you are building those skills. What doesn’t have an apparent skill benefit to you, convert it into something that will. As needed, slow things down for a moment (by inserting a drill – read this to understand drills better) when you find your quality, and therefore your focus, diminishing below acceptable. Fitness can improve with mindless swimming, but skill (and hence, performance) will not. I was inspired to start sharing this exercise on the blog once in a while, and a perfect opportunity presented itself to me. At the moment I happen to be back in my home state of Oregon USA for a few weeks, which means I am back in a 25 yard pool for most of my time here. At my first day in the local pool I saw the ubiquitous masters swim workout written on the white board for swimmers to follow that day. Now, there was no additional notation whatsoever on the board. Would you know what to do with that practice? Do you know how it would improve your performance? What skills were you suppose to develop? How do you personalize it to fit your person, and your point in the season? When you got done with the workout, how would you know whether you were a better swimmer than when you started? 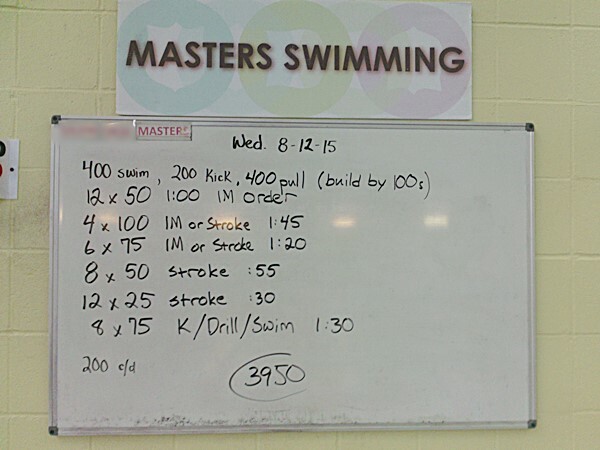 I wasn’t there during the masters workout that morning so I have no idea what additional instruction, what focus, guidance or personalization the live coach may have offered to the swimmers on each part of this workout. But the written instructions alone offered very little to the swimmer other than a way to divide up some distance during their time in the water. So what I am going to do is, as some call it, to “TI-ify” the workout and make it a practice. Workouts are about raising heart rate and pumping muscles. Practice is about increasing skills that make high performance accessible. Remember what I often repeat: fitness is your ability to generate power and sustain it, skill (or technique) is your ability to apply that power precisely where/how/when it is needed. Fitness supplies, technique applies. So, while we will let fitness happen during this practice with the distance and intensity, let’s make sure it builds some performance-enhancing skills in a way that sticks too. What do you do to convert this into a practice? 1) Identify skill sets you want to work on. 2) Choose specific points in those skills you will work on today. For the Other Strokes section there needs to be perhaps 2 focal points for each stroke style. B – entry point and pathway of arms as they enter the water in front of the head. For each of these you may pick a very specific improvement or correction – in the form of a command to your muscles – as your focal point. For the freestyle section, where precision will be challenged as intensity increases, you may pick focal points that relate directly to the parts of your stroke that tend to fail when you feel the stress of higher intensity. 3) Monitor and measure those specific skills. There must be a feedback loop that has you set intention, take action, measure how closely you achieved the intention and repeat again with any correction needed. You either need to feel it, see it, or have some outside device or observer tell you how close you are to what you intended to achieve. 4x 50 + 6x 50 Asymmetric Tempo Pyramid – start at a comfortable tempo, on 4x 50 slow tempo by .08 by 50s, then on 6x 50 speed up tempo by .04 by 50s. Count strokes. Goal: finish at starting tempo with lower SPL than at start. Choose 1 to 3 points (used one at a time) which will help you preserve your stroke length. 2x 100 with 8-12 nasal breath rest at wall, hold SPL or improve on each. If desired, use Tempo Trainer (TT) set to comfortable tempo (TC) to add pace control challenge. Compare ease and productivity of 6-Beat versus 2-Beat Kick. * Some explanation of Slide and Glide, and Example. Now, with a skill-orientation to swim practice, the Total Immersion method provides endless ways to personalize such generic practices. For this particular example I have simply imagined a swimmer with certain capabilities and needs in mind and applied some TI practice planning principles to the conversion. I might get swamped by this invitation, but I will offer it out of curiosity. If you would like to see how I might modify a masters workout you have on hand, send it to me along with the specific stroke and/or pacing (SPL, Tempo) skills you would like to work on using this practice – if I think it would be helpful to others I will convert it and post it here on the blog. If I get overloaded with submissions I will just pick one from time to time and post it here.